PANAMA the outstanding #1 in Italy! A great branch of the Ralma Juror Faith has developed at Bouw Holsteins, the Femmy's! RED and POLLED out of the Golden-Oaks Mark Prudence!! One of the highest red heifers in Europe!! GTPI +2620 & 435 NVI Kerrigan dtr! The former #1 RZG Mega Watt dtr in Europe! Full sister to the former #1 GTPI Female in Europe! Huge production heifer: +2322 Milk, +71 lbs PROTEIN and +1.6 DPR!! 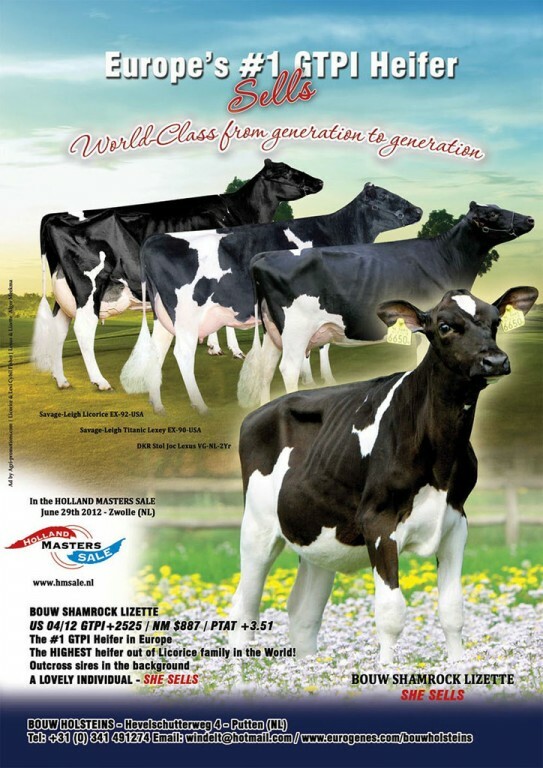 Welcome to the website of Bouw Holsteins Bouw Holsteins has always the best and most interesting genetics available. Currently we are working with top descendents of families like that of Krull Broker Elegance, Ralma Juror Faith, Larcrest Cosmopolitan, Cinderella's, Regan-Joy Durham Regenia, Markwell Durham Daisy, Lylehaven Lila Z and Savage-Leigh Licorice Do not hestitate to contact us for more information.